I’ve been keeping a little secret for quite some while now and today is the day to fill you all in on the details! In celebration of my sweet little baby who’s currently baking away third trimester style I’ve partnered with 10 amazing shops and companies to give one of you a bevy of amazing products and shop credits. Eek! I know! Be excited!!! I know most baby giveaways happen once baby is born, but seeing that this is my third little one, I have a pretty good handle on how my postpartum life goes. For me, postpartum is full of little sleep, lots of snuggles and not much organization when it comes to blogging. So, while I’m on top of my game, now seemed like the ideal time to introduce you to these amazing folks and give you the opportunity to win AND WIN BIG! One lucky lady (or dad or grandma or whomever) will soon be the proud owner of all these goodies! You’re going to fall in love with NEN’s vegan and organic beauty products! The owner, Kelby, is a fabulous gal who really knows her stuff when it comes to what new mamas need to support their prenatal and postpartum bodies. That’s why she is giving away a new mama bundle filled with magnesium bath salts, magnesium body butter and a fancy face mask. It may be the homeschooling mom in me, but I’m a wee bit obsessed with Dawn Publications books. Not only do they have beautiful illustrations, they’re educational and the perfect introduction to books for your little readers. Dawn Publications will be sending the winner 3 board books — If You were my Baby, Jo MacDonald Had a Garden and Forest Bright, Forest Night. It seems that I’ve been blessed with quite a few talented friends and the folks at Ah! Natural Baby are no exception! Get ready to enjoy a set of counting blocks, teether of your choice and, my favorite, custom name blocks. Made from locally harvested wood and sealed with natural waxes and oils, the products at Ah! Natural Baby definitely fall into the category of heirloom toys. You all know I love and adore Madre Beads since they’re eco-friendly, non-toxic and perfect for nursing and babywearing moms. Fellow blogger, Lacy, launched Madre Beads earlier this year and every design release has gotten better and better. Browse her shop and find your favorite mama necklace and pacifier clip – the winner will get to choose one of each! Ya’ll, I met Danielle at my local farmer’s market and she is such an amazing mama and creator! Her shop, Pieces to Peaces, is full of darling headbands, bows, beanies and scarves perfect for mamas and littles. With a $30 credit to Pieces to Peaces you can pick something for you and your kiddo! I gave a sneak peek of my LWPH find on Instagram last week. Did you see it? Well, you too can pick something you love with a $30 credit to Jen’s shop. I swoon for all the fabric choices, so modern and darling! Which one are you going to choose? Covered Goods is giving away any cover of your choice! And there are no many to choose from AND so many uses … I love multi-purpose items! Oh happy day! The wonderful team at Lily Jade has an Elizabeth in red canvas set aside for a very deserving mama. I repeat … one of you will be the proud new owner of my favorite diaper bag! Lily Jade bags are the diaper bags that don’t look like diaper bags while functioning like the best ones on the market. The baby bag insert is pure genius and you’ll love the versatility of carrying this bag with a cross body strap, wearing it like a backpack or utilizing the sturdy leather handles. Nothing is better than print work from Minted. They’ve been our staple the last few years for Christmas cards and I can’t wait to order this sweet babe’s birth announcements from them! You too can pick out the most hip and beautiful birth announcements with a credit for 100 Minted announcements. I’m a new lover of Soul Slings and you and I will soon be babywearing twins since we’ll both have a coal single layer linen ring sling. I’ve been belly wrapping these days, but can’t wait to snuggle my little man close in just a few weeks. If you don’t already love ring slings, I promise you will soon! There is a small learning curve, but once you’ve got it, you’ll ring sling your baby all day, every day! 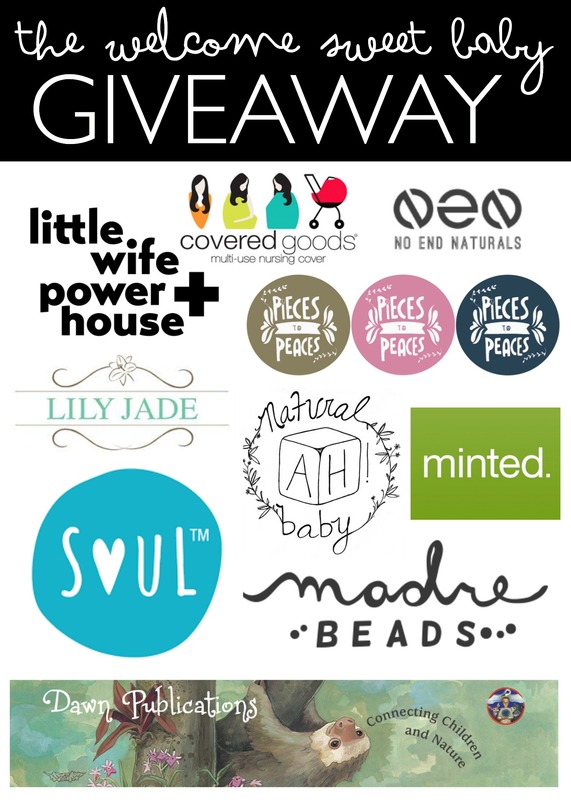 A huge thank you to each of these shops for joining in the giveaway to welcome my little one and yours too! To enter, follow the steps on the Rafflecopter below. This giveaway is only open to US mailing addresses. A winner will be verified and contacted on November 7th … keep an eye on your email! I have a sweet 5 month old that this would be for! I’m due in may with baby #3! Yay for families of 5! I have been eyeing Lily Jade for so long and of course I love me some Madre Beads! Due in May…these things all look amazing! I feel like I’ve entered so many giveaways and never won a one (except the TULA I won for Katie) that it’s about time. The odds should be in my favor…yes? I have been pining after a Lily Jade bag! I want a Lily Jade bag so bad! A Soul Sling too!!! Goodness me all these products look incredible!! Coveredgoods genius! Due in late January with baby girl número 3! My sister and I are due about two weeks apart, so I’d most definitely share these with her. Love the Lily Jade bag! Gorgeous! I’m due in April. Love all the goodies you have! I am due April 9th! I ADORE covered goods !! Would love to win to share some goodies with friends with new bundles! So excited about this one! I’m due in May with my third… three under four! They all sound like great prizes! Ah! Natural Baby name blocks…what a cute idea! Aren’t they? Such a cute way to style a photo shoot with our little ones. I’m in the market for most of these items for our third due in April! Would LOVE to win this giveaway! I would love the Madre beads! I’m due tomorrow!!! So I’m all for this giveaway! I’ve been wanting the Lily jade Elizabeth diaper bag and a covered goods nursing cover! They’re both amazing products! Due in February, how can I pick a favorite shop?! What an amazing local networking opportunity! I am most excited about the sling! I would love to have my hands free! I’m most excited about Soul Slings! That sling looks amazing! So amazing! And mine is breaking in like a dream! I’m so excited about the Lily Jade bag! I would share this with my friend , who is also due December, with her first boy! Thanks! Such a boom of baby boys in December … I know at least 5 on their way! I have a newborn and would love to win this! What a wonderful giveaway! Lily Jade, wow! Woot woot. This would be awesome. This is an amazing giveaway. Everything looks awesome! I am especially excited about a Lily Jade! I would share some of the goodies with my friend who is due in spring and use some for my own little one. Yay for sharing the love! Love this giveaway! I can’t choose one store that I am most excited about, but I do love Lily Jade! I could prob use most of the stuff myself, but if not would love to share with a sweet sister. I would love to share this with my sister as they welcome my new niece or nephew after fertility issues for several years! I would love love the Lily Jade bag especially! I’m due with our fifth any day now. Right? I can’t wait to pick out baby announcements from Minted! This really is the perfect giveaway…..so many many great shops have participated. I’m super excited for whoever wins this! Ohhhhhh sweetness! Every single thing you chose is a treasure! I think that diaper bag is amazing or the LWPH looks adorable. Oh my gosh! I’m due in February with baby #4 and would loooooove to have some nice new things to replace the worn out ones. :) This is a great spread! Isn’t that the truth? By #3 I’ve needed to freshen up quite a few things. Babies are rough on their supplies! What a package! I’m scheduled for c-section #4 right before Christmas, in fact will be spending Christmas in the hospital. What a fun treat this would be! Minted credit and that bag?! I’ll have another baby just to win these goodies!! I cannot wait to share these goodies with two of my pregnant friends… they could both use some comfort and joy right now! And we’ll share the books with a local shelter… they’re always in need of new books. I feel so out of place, I’m a first time mommy and have no idea about any of these little treasures everyone speaks of. I actually stumbled across this while searching some baby things on my Instagram, I saw this give away and looked up each item in hopes it would enlighten me on actual things I’ll be needing. I am a young mother, twenty to be exact, that has no real direction or navigation for how I am supposed to be not only experiencing parenting and mommy hood but enjoying the perks of it. This giveaway gives me another look at how to incorporate some new things/new beginnings into my journey , from the books giving me the idea to homeschool , to the baby sling creating a closer bond to my little one. It’s not only the giveaway but people behind it , it gives me a true vision of how else to experience this, I looked at each donator’s page and saw so many SO MANY things I’d never seen or been exposed to when it came down motherhood , no one ever talks about home schooling,going organic,being intune mommies , or Exposing baby to any of these things. Even if I don’t win I’ve won another perspective! If I win I will share all my knowledge and new beginnings with family and friends around me, show them my new finds and encourage them to take on the new approach , opposed to the things we’ve been exposed to. I will show them a twenty year old with a open minded approach to my beautiful journey , in hopes to inspire young moms or even older moms who don’t know about these finds and ways! For baby Elle Analise <3! I would love some gorgeous Minted cards to send out at Christmas! I love Lily Jade! But oh my goodness! Some beautiful shops here! I don’t think I can pick! Id love to try no end naturals. I love natural products and love discovering new companies that make amazing stuff.